I kind of hate Halloween. Every year as my friends eagerly plan their kids’ costumes – and sometimes, even their own – I groan inwardly and secretly count the days until November 1st. Maybe my parents scarred me for life when they dressed me, at three, in a yellow pillow case, slapped a pink bow on my head, and called me Ms. Pac-Man (35 years later, my mom insists on defending this costume). Or maybe it’s the simple fact that Halloween in Miami, when temperatures are near ninety and the humidity is thick enough to wear its own witch’s hat, is anything but fun when dragging two sweaty little boys by the hands for blocks and blocks and blocks. Part three: Bedtime. And, you guessed it. The joke is most definitely on me. Though I pride myself on creativity, my boys’ Halloween costumes have been sorely unoriginal. I’m hardly a Pinterest perfect “Spooktacular Snack” maker, and I’m definitely not one who decorates the outside of my house with a scary landscape sure to make the neighborhood kids scream. I do carve a mean pumpkin, though. And when my kids are excited because their friends are excited and they want nothing more than to get into the Halloween spirit, there is one thing I do enjoy– and I enjoy it tremendously. I break out all of our spooky-but-definitely-not-scary books, where monsters and witches and ghosts creep across the pages and make my kids squeal with their deliciously monstrous fun. Though these books contain characters we usually think are “scary,” each story will surprise your family with valuable lessons about creativity, friendship, and empathy. These messages are valuable all year round, not just during Halloween season! Without further ado, here are our favorite books about monsters, witches, ghost, and other ghouls. Enjoy! 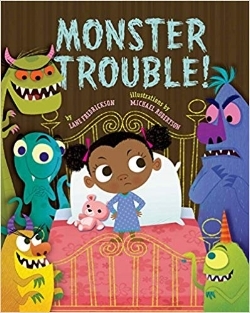 ﻿Monster Trouble!, by Lane Fredrickson and illustrated by Michael Robertson: Poor Winifred Schnitzel can’t seem to get rid of the neighborhood monsters that creep into her room at night and desperately try to scare her silly. Can she make them go away with a kiss? How to Make Friends with a Ghost by Rebecca Green: What happens when you come face to face with a scary ghost? 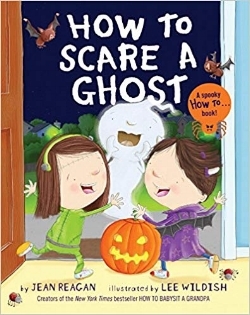 Make sure to grab this book if you want to have the essential tips handy, because some ghosts may simply need a friend. If you are sweet and warm and kind, I suggest you be on the lookout because a ghost may find you soon! 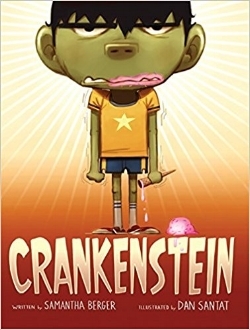 Crankenstein, by Samantha Berger and illustrated by Dan Santat: Even the sweetest kids become Crankensteins, from dusk till dawn, in rain, in heat and – most certainly – when standing in long, long lines. Beware the cantankerous Crankenstein! Vampirina Ballerina, by Anne Marie Pace and LeUyen Pham: A young ballerina struggles to fit in when she can only take dance class at night and fights urges to take nibbles out of her fellow dancers. Will the delicate vampire become the prima ballerina she desires? Creepy Carrots!, by Aaron Reynolds and illustrated by Peter Brown:Jasper rabbit loves carrots, especially the ones that grow in Crackenhopper field. He can never get enough of them, but will his greed become his undoing as the carrots begin to haunt him? Make sure to also check out the second tale about Jasper, one of our new family favorites— Creepy Pair of Underwear! How to Scare a Ghost, by Jean Reagan and illustrated by Lee Wildish: This Halloween, you are guaranteed to be the one doing the scaring, not those daunting ghosts! Read this book for the ultimate list of tips to frighten your ghouls— and then have some fun with them too. 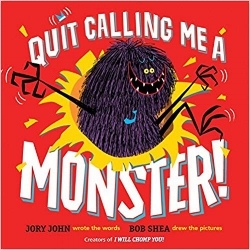 Quit Calling Me a Monster!, by Jory John and illustrated by Bob Shea:Even monsters try to buck stereotypes. Poor Floyd Peterson wants nothing more than to tell his readers that not all monsters are bad, even though they have fangs and crazy hair and clompy feet. Didn’t you know that monsters have feelings too? Won’t you just give him a chance? Leo: A Ghost Story, by Mac Barnett and illustrated by Christian Robinson:A little ghost’s attempts to welcome the new family in his home are sorely misunderstood. Leo gathers he is unwanted and decides to leave. He meets a new pal on his journey, and using his wits, Leo teaches others that he is more friend than foe. 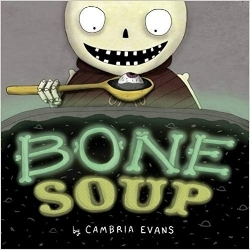 Bone Soup, by Cambria Evans: Finnigan the skeleton is known for being greedy and having an insatiable appetite. When he arrives in a town replete with witches and ghouls, not a creature in site will share their food with him. How will he entice them to give him some grub? Stir up a magical bone soup, of course. 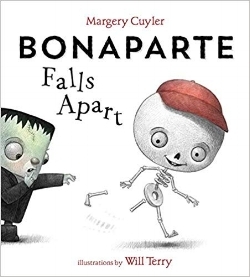 Bonaparte Falls Apart, by Margery Cuyler and illustrated by Will Terry: Oh, sweet Bonaparte! The skeleton’s bones seems to fall apart more than they stick together, making it awfully hard for him to get a hold of himself and make new friends. Luckily, with the help of pals Franky Stein and Mummicula, Bonaparte finds a way to keep himself in one piece. Boo Who?, by Ben Clanton: It’s hard being the new kid in town, especially when that new kid is a ghost who has trouble playing games with the other neighborhood creatures. But even the ghost on the block can find a way to play, and he just might find that his greatest deficits are also his biggest strengths. The Monsters’ Monster, by Patrick McDonnell: What do you do when your mean, mean monster always seems to remember his manners? Take him up on his offer to share a warm jelly doughnut! My Teacher Is a Monster! (No, I Am Not. 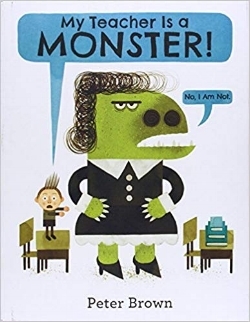 ), by Peter Brown: Bobby has the worst teacher in the world, and she is, most definitely, a monster. But when he runs into Ms. Kirby at the park and a fierce wind blows away her hat, a turn of events helps Bobby realize that Ms. Kirby may have more bark than bite. 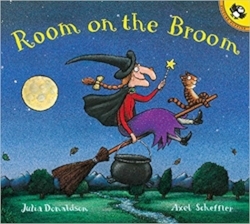 Room on the Broom, by Julia Donaldson and illustrated by Axel Scheffler: A generous witch makes room for helpful animals on her broom until the broom is so heavy, it breaks. When a dragon comes for the witch, all the little animals join together to scare the dragon away. 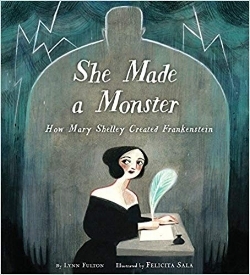 She Made a Monster: How Mary Shelley Created Frankenstein, by Lynn Fulton: This is a fascinating picture book biography about the woman who created Frankenstein, a monstrous figment of her imagination that has lived on for more than 200 years. The above links to Amazon are affiliate links. HEE received some, but not all of these books from the publishers. However, all opinions expressed herein are entirely our own.